If it is October, it’s Schwerpunkt time. Or at least that has been the case for over 20 years for this long-running magazine-scenario pack combo. 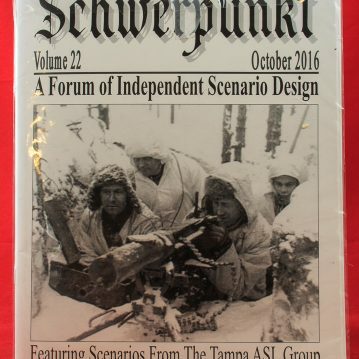 As the leaves turn color and football weather really sets in, one can always expect Schwerpunkt to regale us with the ghosts of 1944. 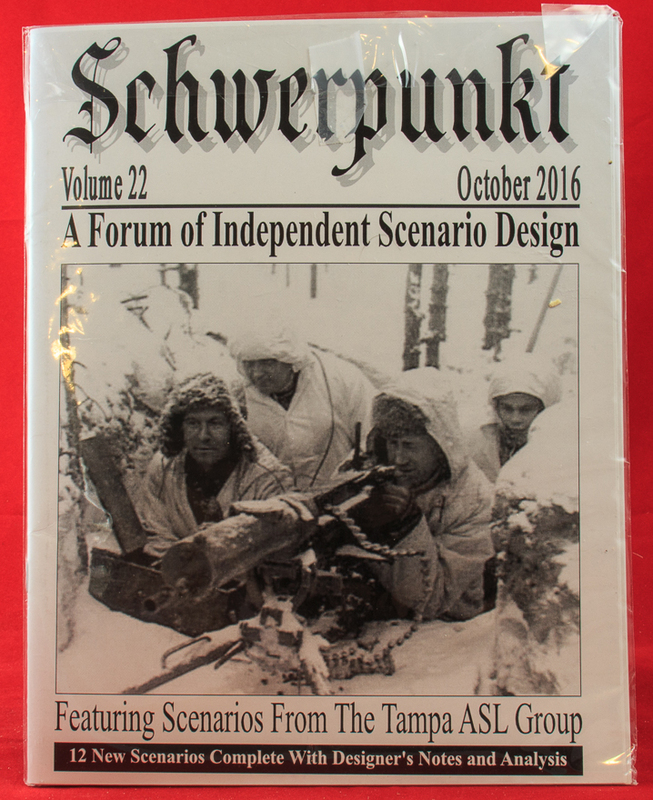 Schwerpunkt Volume 22, which debuted at the ASLOK ASL convention in Cleveland in October 2016, contains a small magazine and a dozen new scenarios. The magazine itself clocks in at only 20 pages, the bulk of which are taken up by designers’ and players’ notes for the included scenarios. Aside from that, there is only a historical article by Brook White on the Belgians and Dutch in ASL. The “mixed bag” scenarios for this volume include actions set in Finland 1939, Netherlands 1940, France 1940, Soviet Union (1941, 1942 , 1943), Dutch East Indies 1942, France 1944 , Hungary 1944, and Austria 1945. Note that the time range is a bit unusual for Schwerpunkt, the scenarios of which generally tend to be set in 1944-45. 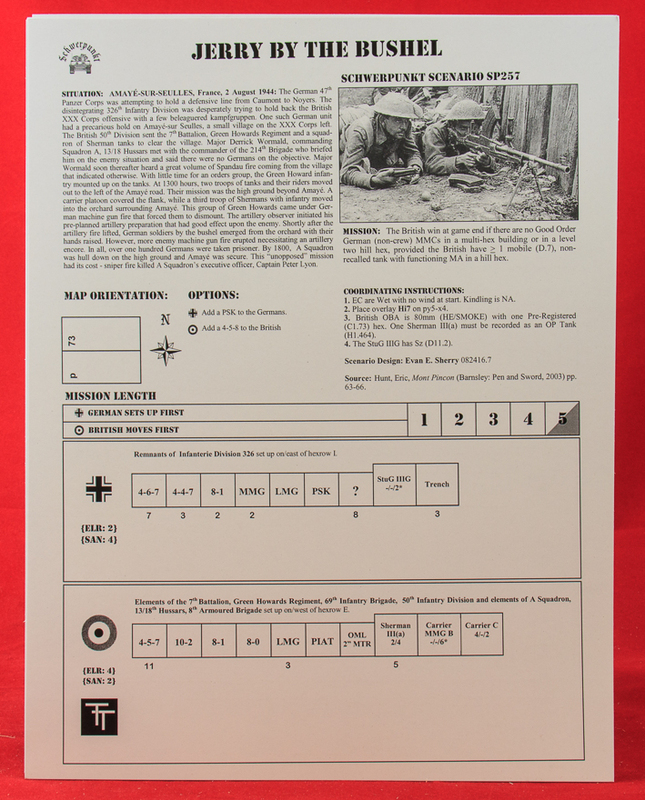 Here, a full 8 scenarios are set in 1943 or earlier, which provides more variety and makes the scenarios seem more differentiated. To play all of the scenarios, the following boards are required: 2, 11, 20, 23, 59, 83, 67, 69, 70, 71, 72, 73, 75, 2a, 2b, 5a, 8a, 9a, and ASLSK board p.
Of the scenarios, only a couple are small, while the remainder are evenly divided between medium and large, though this is a bit misleading, in that several of the medium scenarios are only barely medium, while several of the large are only barely large. There are no huge scenarios here and many of the scenarios of Volume 22 are suitable for tournament play. As is typical with Schwerpunkt scenarios, there is not much in the way of OBA, Air, or Night rules; indeed, none appear in this volume. The Dutch have seen a fair amount of ASL attention recently, thanks to the combination of a Dutch scenario designer as well as the publication of several books on the Dutch in World War II in English in recent years. Thanks to such works, Evan Sherry was able to bring to his audience SP256 (De Veer’s Counterattack), a compact Dutch East Indies scenario in which both the Dutch and the Japanese get to attack and defend. It looks as if it could be good tournament fare. 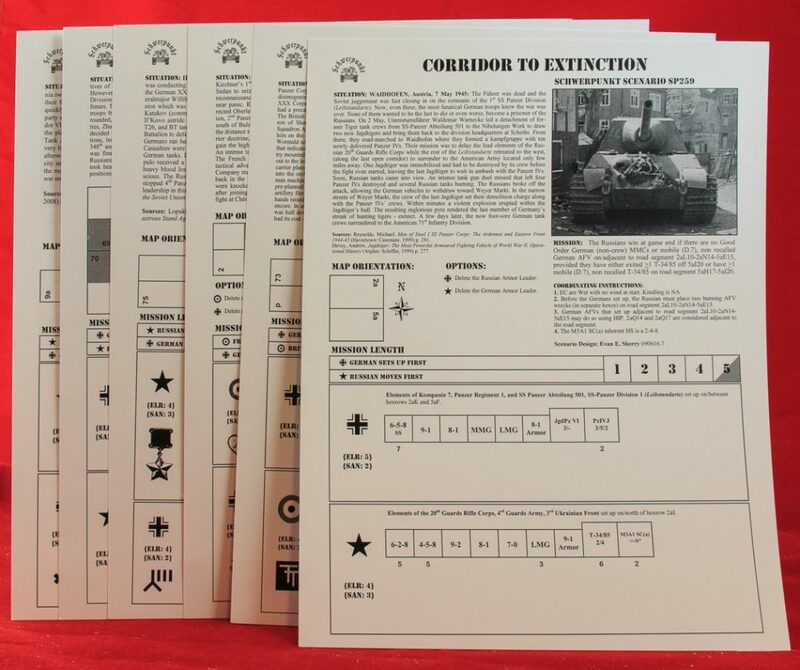 SP255 (Anatoly’s Ambush) offers ASL players the thrill of a tin-can armor clash as 9 German Mk III AFVs and assorted other units take on an equal number of Soviet light early war tanks of a variety of types. Another early war armor action can be found in SP254 (Propitious Arrival), a France 1940 action that pits 5 good German AFVs against 10 French FCM 36s. The most popular scenario (so far) is SP259 (Corridor to Extinction); its early popularity clearly being due to the fact that it is a fast-playing SS vs. Soviets late war East Front action with AFVs and elite forces on both sides. As is typical for Schwerpunkt, the scenarios have few SSRs and basic victory conditions. Overall, they seem to be a decent batch of scenarios.